What is ZAP Business Intelligence? 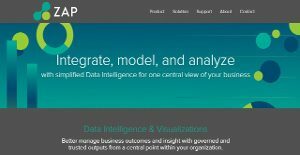 ZAP Business Intelligence is a single intelligence platform that offers integrated data modeling experience and supports all self-service, enterprise, and embedded business intelligence requirements. The system offers businesses with a singular, centralized view of their business in terms of data intelligence. With ZAP, businesses have a user-friendly and feature rich interface that allows them to integrate various data sources and supports complicated analytical scenarios. ZAP’s data modeling functionality makes it easy for businesses to build data models that are manageable and easily duplicated. Whether by self service or under corporate control, ZAP delivers an enterprise grade business intelligence and visualization platform that provides businesses with analytical outcomes and reporting. ZAP Business Intelligence presents a plethora of features and functionality that simplifies data modeling, reporting, and analytics to mention a few. The system supports a wide range of data sources, including Excel files, on-premises and cloud-based apps (Microsoft Dynamics, Salesforce), and common database servers (Oracle and SQL). ZAP is designed to be very friendly, even for non-technical users. They don’t have to deal or create codes or even call on developers to create analytics. The unique user interface comes loaded with useful tools and is designed to be fully functional and versatile at its core. Essential features include reports, ad-hoc analysis, scorecards, dashboards, and Key Performance Indicators (KPIs). Advanced functionalities such as automated management reporting, what-if analysis, alerts, and report scheduling helps enhance the overall operational effectiveness while improving the bottom-line profitability. With a user-friendly interface, ZAP is meant to simplify the user’s business intelligence journey. Whether for self-service or complicated BI requirements, ZAP instantly profiles data according to types, key elements, and relationships. The system also offers users on how their data should be presented (union, aggregated, etc.). The system also helps businesses spot issues with its automated discovery and learning capability. Relevant parties are instantly notified of performance changes, with alerts containing detailed reports on the cause of performance changes. If you are considering ZAP Business Intelligence it may also be beneficial to investigate other subcategories of Best Business Intelligence Software listed in our base of B2B software reviews. Enterprises have different wants and requirements and no software platform can be just right in such a scenario. It is futile to try to find an ideal off-the-shelf software product that fulfills all your business needs. The smart thing to do would be to adapt the system for your special needs, worker skill levels, finances, and other aspects. For these reasons, do not rush and pay for well-publicized leading solutions. Though these may be widely used, they may not be the perfect fit for your unique wants. Do your research, check out each short-listed platform in detail, read a few ZAP Business Intelligence reviews, contact the maker for explanations, and finally select the app that offers what you require. How Much Does ZAP Business Intelligence Cost? We realize that when you make a decision to buy Business Intelligence Software it’s important not only to see how experts evaluate it in their reviews, but also to find out if the real people and companies that buy it are actually satisfied with the product. That’s why we’ve created our behavior-based Customer Satisfaction Algorithm™ that gathers customer reviews, comments and ZAP Business Intelligence reviews across a wide range of social media sites. The data is then presented in an easy to digest form showing how many people had positive and negative experience with ZAP Business Intelligence. With that information at hand you should be equipped to make an informed buying decision that you won’t regret. The decision made on AX was already made with ZAP. ZAPBI is the best there is! What are ZAP Business Intelligence pricing details? What integrations are available for ZAP Business Intelligence? Pros: ZAP's Cube Express lets us build any custom, simple to understand report easily. It does an amazing job of reading the relationships and having them ready for you when you go to build. Support has been very helpful to us as well. Cons: I would have liked that the migration was covered if it is done within a certain number of months. That's not a deal breaker by any means though. We also haven’t upgraded to the latest version yet so we have yet to comment of any problems. Pros: The instructor who helped us in installing ZAP was very well versed in her knowledge and rexperience with the tool. She was also interested in what we wanted to know and was willing to take the discussion further after class was done to help. I found the training to be spot on in addressing my need and not hard to understand. Cons: My biggest challenge was the sudden changes as we are not on the newest version of the application. Being a few versions behind, they don't offer in class training on older versions. I do not fault ZAP for keeping up while my company has yet to do so. ZAP is a user-friendly tool for any report developer. A learning curve that can save you lots of time! The missing puzzle for Microsoft Dynamics AX. If you need more information about ZAP Business Intelligence or you simply have a question let us know what you need and we’ll forward your request directly to the vendor.